At the start of the 1967-68 season the NHL expanded to 12 teams with the addition of the Minnesota North Stars, the Pittsburgh Penguins, the Philadelphia Flyers, the Los Angeles Kings, the St. Louis Blues, and the California Seals. Now, the question was, who would be the 1st expansion team to win the Stanley Cup? Terry Crisp joined the Flyers in the 1972-73. 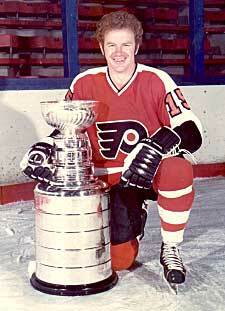 By the 1973-74 season , the Flyers were poised to attempt to win their first Stanley Cup. In the 74 Stanley Cup finals , many stars emerged from the " Broad Street Bullies" team. The Flyers, knocked off the heavily favoured Boston team to become the first expansion team to lay claim to the Holly Grail of Hockey. The 1974-75 season was a hard fought battle to see who would play for Lord Stanley's Cup, but the Flyers emerged again to defend their Cup against the Buffalo Sabres. The Flyers fought off a very determined Buffalo squad to claim their second straight Stanley Cup. There he was, Terry Crisp, part of a great team that won back to back Stanley Cups. In his 5 years with the Flyers Terry played 194 regular season games, scored 25 goals, 49 assists and had 78 minutes in penalties. In the playoffs Terry played 47 games and collected 7 goals, 13 assists and 8 minutes in penalties. The people of Terry's home town , Capreol, are very proud of their local boy, Terry Crisp.